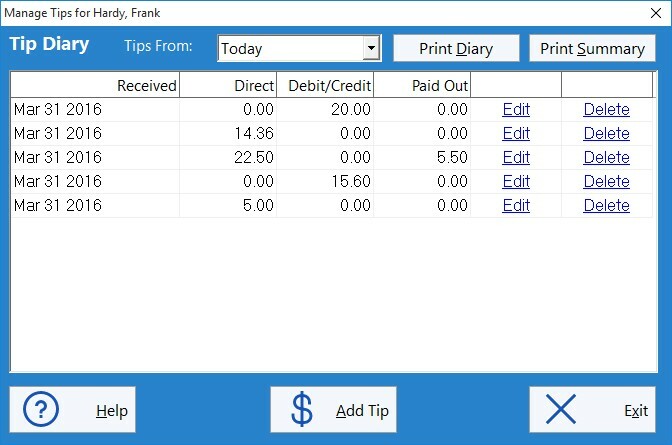 use any computer on your network to record and track employee tips! Run a restaurant? A Cafè? A bar? Do your Employees need to record their time and attendance AND their tips? Then Time Clock MTS is for you! Your application has been a lifesaver for our small company. We have seen a reduction in weekly hours since we started using the fingerprint scanner. This report shows a summary of the tips received and paid out by the employee over the reporting period. 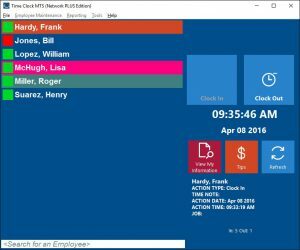 Time Clock MTS is the ideal solution for any business that needs to track their employee time and attendance data AND needs a simple system for their employees to track tips and gratuities. 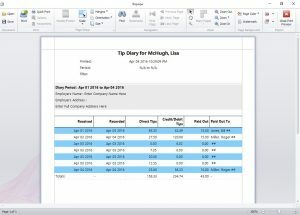 The employee tip tracking system in Time Clock MTS allows employees to record their tips received and paid out and then report on those across any time period. 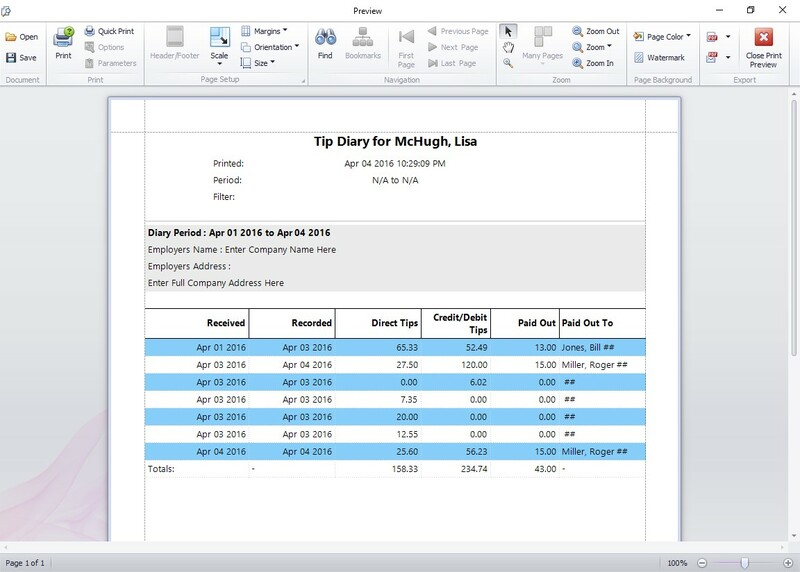 The built in reports provide all information required for an employees tip diary and can summarize this information to allow for employer tip reporting to the IRS. 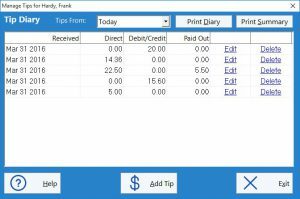 Tracking Tips and Gratuities Couldn’t be any Simpler! Start up Time Clock MTS. Log in as the time clock administrator and go to the Interface Settings screen. Check the “Enable Tip Tracking” check box and save the settings. Have your employees record their tips received by clicking the TIPS button on the employee time clock! Record Tips by Clicking the TIPS button. Above you can see the employee time clock screen with the tips button visible. 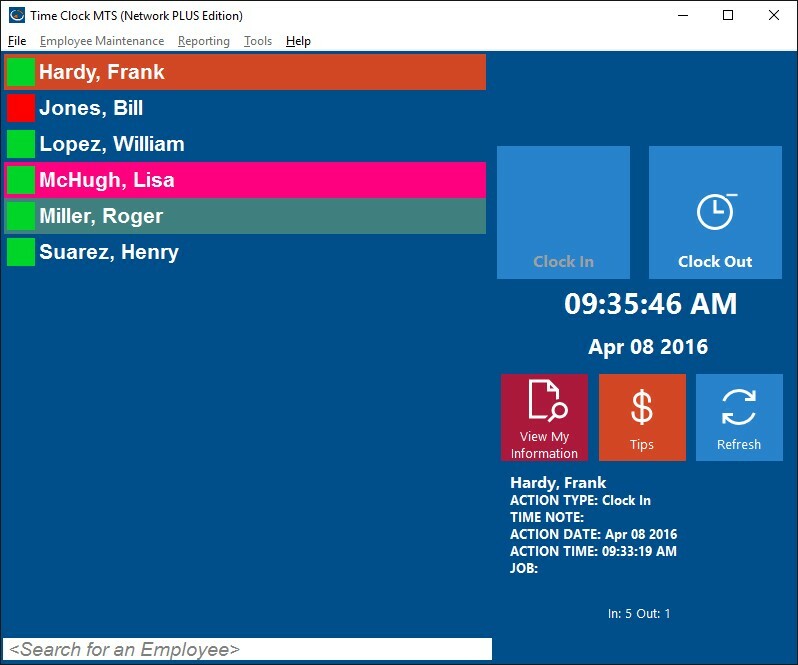 Any employees tips can be managed and reported on directly while logged into Time Clock MTS in administrator mode. When running in normal mode you can configure Time Clock MTS to require employees to enter a PIN or scan a fingerprint before they can access their electronic tip diary.